This antioxidant-rich breakfast dish is heart-healthy, full of beneficial fibre and contains warming cinnamon, which has antiseptic properties. * Place the fresh berries in a food processor or blender, and blitz until smooth (avoid puréeing blueberries, if using, as their flavour is lost when blended with other berries). If you want the sauce to be free from pips, strain it through a fine sieve. Set the sauce aside while you make the pancakes. * Mix together the buckwheat flour, baking powder, rou gui or cinnamon, and salt in a mixing bowl. In another bowl, whisk together the rice milk and egg. Gradually pour the egg mixture into the dry ingredients, whisking constantly as you do so, to form a smooth batter. * Heat a frying pan, brush the base and sides with a knob of ghee, then ladle a little of the pancake mixture into the pan to make a thin pancake. Fry for 2–3 minutes, then toss or turn the pancake and cook it on the other side. Keep the cooked pancakes hot by stacking them on a plate set over a bowl of very hot water while you repeat with the rest of the batter. * Stir the blueberries, if using, into the berry sauce. 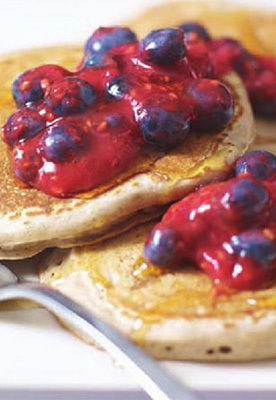 Drizzle the pancakes with maple syrup and serve with the berry sauce.